Galerie Jean Fournier has the pleasure of presenting Fabienne Gaston-Dreyfus’s first solo exhibition: a group of recent works comprising large and medium-format canvases and gouaches on paper. Partly founded on colour and its variations and interactions, her work also endows painting with a performative dimension. Between 2004 and 2009 she was producing big canvases in which bits and pieces, traces, runs, and sometimes shapes in the form of areas of solid colour brought an uncertain equilibrium to relative chaos, seemingly hovering amid the white space of the canvas. Attentive to issues relating to the body and gesture, the artist came to a turning point in 2013 when she began painting with her left hand. The upshot was new sensations, new movements and a different apprehension of space. The resultant gesturality was then repeated using a wide brush. Determined by the sweep of the arm, this succession of movements gives rise to a rectangular shape made up of stratified colours. 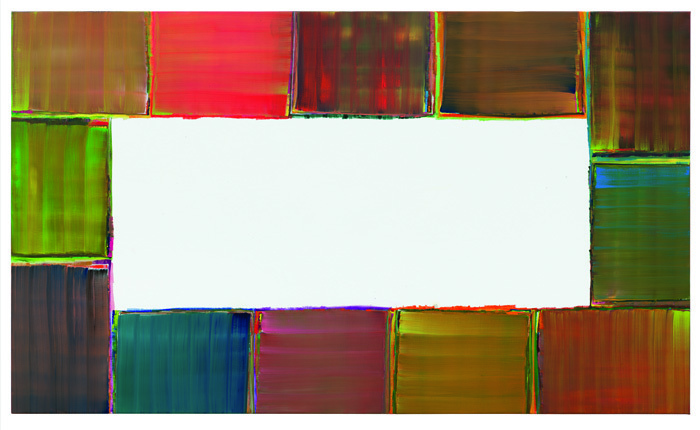 The central area of the canvas is often left white, while around it blocks of colour orchestrate the composition. The white generates a brightness that contrasts and interacts with the juxtaposed slabs of colour. Layers of colour are mixed directly on the canvas, then overlaid. The marks left by the horizontal and vertical movements of the brush remain visible indicators of a certain gestural mechanics, while the various coloured strata show through along the edges. Sometimes the accumulation of several dozen thin layers of oil paint induces a muted luminosity. In addition to her canvases Gaston-Dreyfus paints smaller gouaches on paper, and the two groups interact in a process of complementarity and reciprocal impetus. The gouaches offer greater gestural and formal variation: unlike the canvases, these compositions are concentrated at the centre of the paper, and formally speaking we can sometimes detect touches of humour and irony reminiscent of some of the work of Philip Guston.